MorganStanleyGate: Color of Law Indictment Filed Against 35 Public Officials in FL, KS & NC . . . Reflected below is the Criminal Complaint filed today with relevant offices of the Federal Bureau of Investigation ("FBI") indicting 35 public officials of Florida, Kansas & North Carolina, and 15 private citizens who knowingly played complicit roles in an astonishing number of perpetrated felonies, instigated or otherwise sponsored by Morgan Stanley as part of an elaborate cover-up effort, which is disturbing on so many levels. NOTE: Some of the indicted public officials and private citizens do not have a single picture available on-line (remarkable indeed), so in such cases another picture is used in the "mug shots" above, which may or may not resemble the designated psychopath. 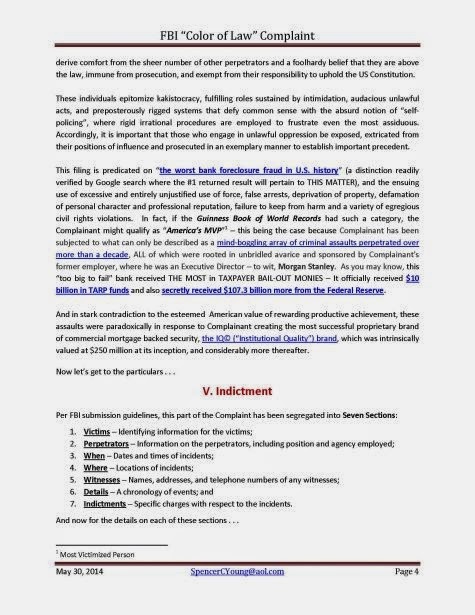 This Indictment is presented here in three formats: (Format # 1) within the body of this Blog Post; (Format # 2) as a Downloadable PDF Document; and as (Format # 3) JPG Images at the bottom of this post. The first two formats contain fully operational hyperlinks to literally thousands of pages of overwhelming evidence. 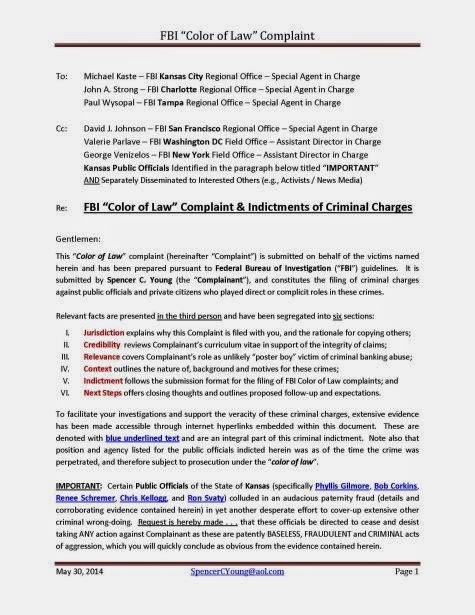 This “Color of Law” complaint (hereinafter “Complaint”) is submitted on behalf of the victims named herein and has been prepared pursuant to Federal Bureau of Investigation (“FBI”) guidelines. It is submitted by Spencer C. Young (the “Complainant”), and constitutes the filing of criminal charges against public officials and private citizens who played direct or complicit roles in these crimes. VI. Next Steps offers closing thoughts and outlines proposed follow-up and expectations. 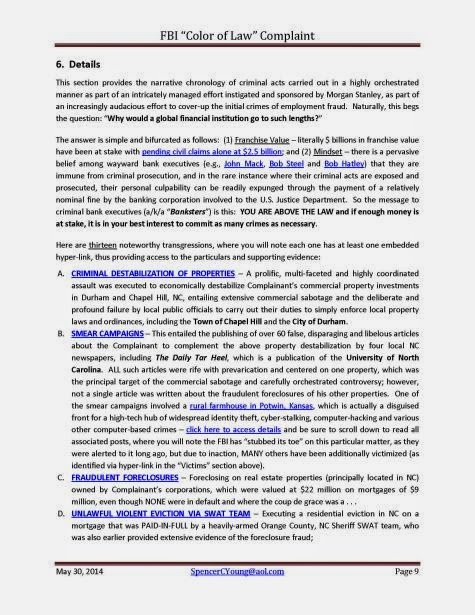 To facilitate your investigations and support the veracity of these criminal charges, extensive evidence has been made accessible through internet hyperlinks embedded within this document. These are denoted with blue underlined text and are an integral part of this criminal indictment. Note also that position and agency listed for the public officials indicted herein was as of the time the crime was perpetrated, and therefore subject to prosecution under the “color of law”. IMPORTANT: Certain Public Officials of the State of Kansas (specifically Phyllis Gilmore, Bob Corkins, Renee Schremer, Chris Kellogg, and Ron Svaty) colluded in an audacious paternity fraud (details and corroborating evidence contained herein) in yet another desperate effort to cover-up extensive other criminal wrong-doing. Request is hereby made . . . that these officials be directed to cease and desist taking ANY action against Complainant as these are patently BASELESS, FRAUDULENT and CRIMINAL acts of aggression, which you will quickly conclude as obvious from the evidence contained herein. 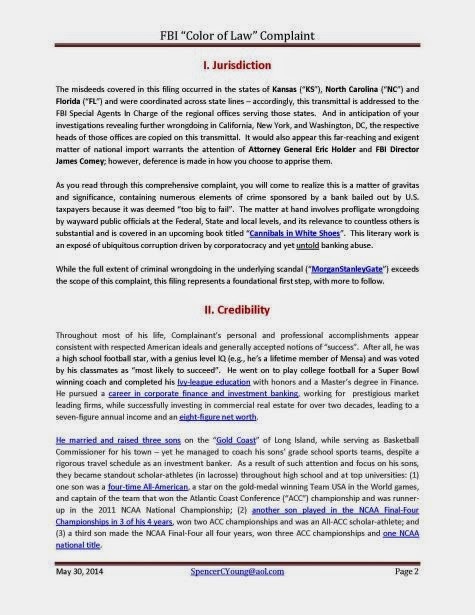 The misdeeds covered in this filing occurred in the states of Kansas (“KS”), North Carolina (“NC”) and Florida (“FL”) and were coordinated across state lines – accordingly, this transmittal is addressed to the FBI Special Agents In Charge of the regional offices serving those states. And in anticipation of your investigations revealing further wrongdoing in California, New York, and Washington, DC, the respective heads of those offices are copied on this transmittal. It would also appear this far-reaching and exigent matter of national import warrants the attention of Attorney General Eric Holder and FBI Director James Comey; however, deference is made in how you choose to apprise them. As you read through this comprehensive complaint, you will come to realize this is a matter of gravitas and significance, containing numerous elements of crime sponsored by a bank bailed out by U.S. taxpayers because it was deemed “too big to fail”. 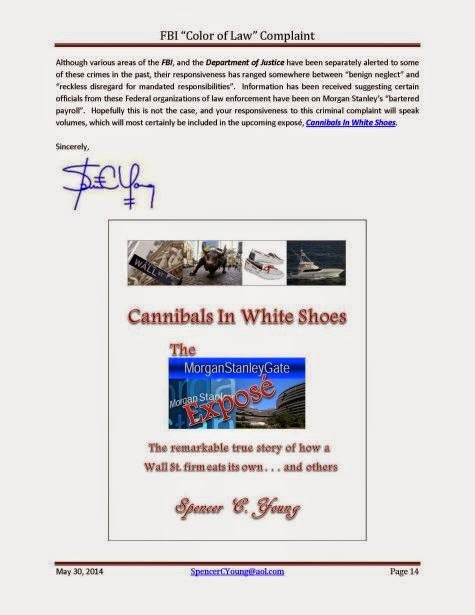 The matter at hand involves profligate wrongdoing by wayward public officials at the Federal, State and local levels, and its relevance to countless others is substantial and is covered in an upcoming book titled “Cannibals in White Shoes”. This literary work is an exposé of ubiquitous corruption driven by corporatocracy and yet untold banking abuse. While the full extent of criminal wrongdoing in the underlying scandal (“MorganStanleyGate”) exceeds the scope of this complaint, this filing represents a foundational first step, with more to follow. Throughout most of his life, Complainant’s personal and professional accomplishments appear consistent with respected American ideals and generally accepted notions of “success”. After all, he was a high school football star, with a genius level IQ (e.g., he’s a lifetime member of Mensa) and was voted by his classmates as “most likely to succeed”. He went on to play college football for a Super Bowl winning coach and completed his Ivy-league education with honors and a Master’s degree in Finance. He pursued a career in corporate finance and investment banking, working for prestigious market leading firms, while successfully investing in commercial real estate for over two decades, leading to a seven-figure annual income and an eight-figure net worth. He married and raised three sons on the “Gold Coast” of Long Island, while serving as Basketball Commissioner for his town – yet he managed to coach his sons’ grade school sports teams, despite a rigorous travel schedule as an investment banker. As a result of such attention and focus on his sons, they became standout scholar-athletes (in lacrosse) throughout high school and at top universities: (1) one son was a four-time All-American, a star on the gold-medal winning Team USA in the World games, and captain of the team that won the Atlantic Coast Conference (“ACC”) championship and was runner-up in the 2011 NCAA National Championship; (2) another son played in the NCAA Final-Four Championships in 3 of his 4 years, won two ACC championships and was an All-ACC scholar-athlete; and (3) a third son made the NCAA Final-Four all four years, won three ACC championships and one NCAA national title. Objective observers might reasonably assess such lifetime accomplishments with litotes along the lines of “not too shabby”. Notwithstanding such accomplishments, Complainant became perhaps the most unlikely “poster-boy” victim of banking abuse in America today. 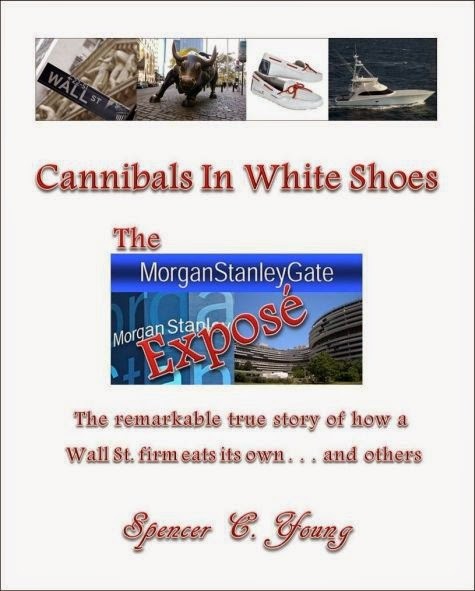 What began as an employment fraud instigated by wayward colleagues at Morgan Stanley, eventually transmogrified into increasingly dastardly and desperate actions to cover up criminal activities now run amok. Moreover, the principal perpetrators ALSO played leading roles in wrecking America’s economy in what is now known as the Great Recession. This depiction as a “poster-boy” is fitting because for more than a decade, Complainant has been subjected to criminal acts encompassing just about "everything under the sun”, and has resulted in pestilent infringements upon his rights to life, liberty, property and the pursuit of happiness. These include instances of Fraud, Racketeering, Extortion, Sabotage, Corruption, and Assassination attempts. But as horrible as these “FRESCA” crimes would appear, they only scratch the surface of the scope and magnitude of transgressions sponsored by Morgan Stanley. This matter involves a profound abuse of authority by federal, state and local government officials, including judicial officials and their staff, public attorneys, law enforcement, political leaders, and other government officials who have knowingly committed, or otherwise played a complicit role in federal crimes through illicit behavior under the “color of law”. Their actions willfully deprived or otherwise conspired to deprive rights protected by the Constitution and US law. Moreover, those culpable have engaged in an unimaginable and expansive array of nefarious criminal acts to cover this up. Recounted herein are instances of misused authority, abuse of the public’s trust and the reckless deployment of local, state and federal resources to further or otherwise cover-up their unsavory agendas and those of criminal others. These include pubic officials who engaged in or were otherwise complicit in felonies and civil rights violations that are so numerous and brazen, it would appear they derive comfort from the sheer number of other perpetrators and a foolhardy belief that they are above the law, immune from prosecution, and exempt from their responsibility to uphold the US Constitution. These individuals epitomize kakistocracy, fulfilling roles sustained by intimidation, audacious unlawful acts, and preposterously rigged systems that defy common sense with the absurd notion of “self-policing”, where rigid irrational procedures are employed to frustrate even the most assiduous. Accordingly, it is important that those who engage in unlawful oppression be exposed, extricated from their positions of influence and prosecuted in an exemplary manner to establish important precedent. This filing is predicated on “the worst bank foreclosure fraud in U.S. history” (a distinction readily verified by Google search where the #1 returned result will pertain to THIS MATTER), and the ensuing use of excessive and entirely unjustified use of force, false arrests, deprivation of property, defamation of personal character and professional reputation, failure to keep from harm and a variety of egregious civil rights violations. 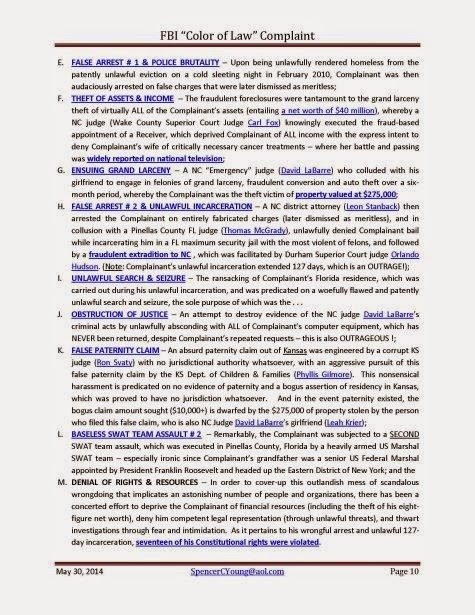 In fact, if the Guinness Book of World Records had such a category, the Complainant might qualify as “America’s MVP” (i.e., Most Victimized Person) – this being the case because Complainant has been subjected to what can only be described as a mind-boggling array of criminal assaults perpetrated over more than a decade, ALL of which were rooted in unbridled avarice and sponsored by Complainant’s former employer, where he was an Executive Director – to wit, Morgan Stanley. As you may know, this “too big to fail” bank received THE MOST in TAXPAYER BAIL-OUT MONIES – It officially received $10 billion in TARP funds and also secretly received $107.3 billion more from the Federal Reserve. 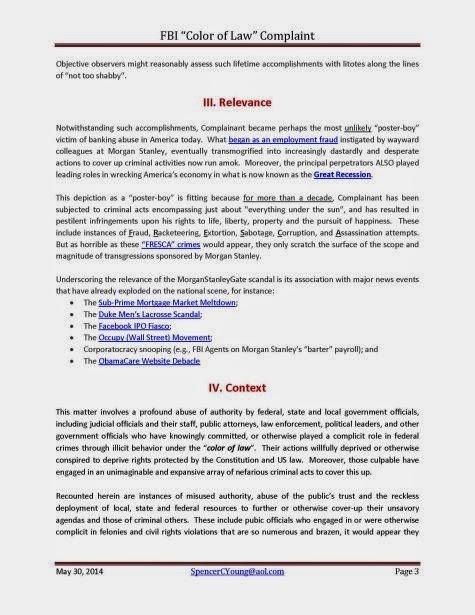 And in stark contradiction to the esteemed American value of rewarding productive achievement, these assaults were paradoxically in response to Complainant creating the most successful proprietary brand of commercial mortgage backed security, the IQ© (“Institutional Quality”) brand, which was intrinsically valued at $250 million at its inception, and considerably more thereafter. Now let’s get to the particulars . . . Indictments – Specific charges with respect to the incidents. And now for the details on each of these sections . . . The identifying information for the victims includes: (1) NAME; (2) RELATION to Complainant; and (3) the principal nature of their VICTIMIZATION. (2) Lack of cooperation by his mother (who is one of the “perpetrators”) in providing buccal samples for DNA testing make validation of paternity as biological father uncertain for the Complainant. IN ADDITION, there are AT LEAST 34 OTHER KNOWN VICTIMS OF CYBER-CRIMES emanating from the SAME unlikely farm in rural Potwin, Kansas. The nature of these crimes include: (1) identity theft; (2) death threat harassment; (3) financial fraud & related theft; (4) hacking of email and social networking accounts; and (5) ties to kidnapping and human trafficking. The complete list of cyber-crime victims can be accessed by clicking here. Thus, there are at least 42 VICTIMS OF FEDERAL CRIMES noted herein. 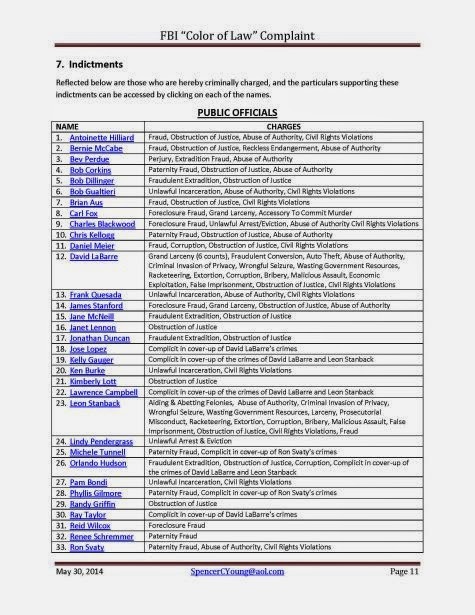 Although the below list of public officials who perpetrated these crimes is long, it is NOT exhaustive, as your investigations will reveal. 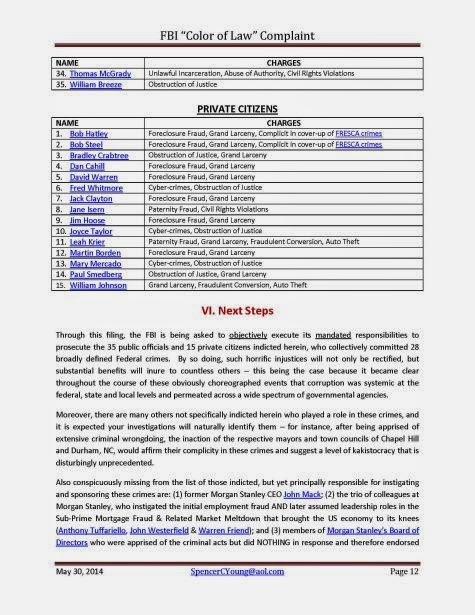 This particular list of individuals are those who committed felonies and/or misdemeanors, and include complicit roles in various “irregularities”, which upon investigation will be exposed as so patently absurd, the intent to cover-up the underlying crimes will be most obvious. 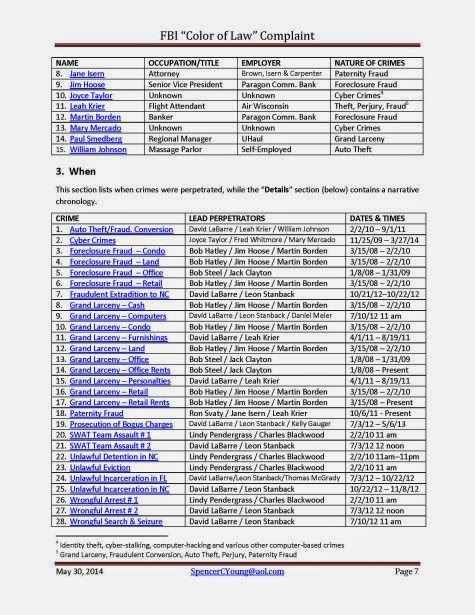 Each name is hyperlinked to the evidence of wrongdoing where many are so extensive, they encompass multiple web-pages, and are thus accessible by clicking on the words “Older Posts” at the bottom of each web page. In most instances, these public officials collaborated with or otherwise instructed private citizens (listed below) to carry out unlawful acts, ALL of which are rooted in FRAUD, who were often provided assurances they would not be prosecuted, and in some instances their cooperation was further assured through use of actual or veiled threats manifesting from an abuse of authority. And because these Private Citizens conspired with the above Public Officials through direct or complicit roles in the commission of the crimes, they are also being formally indicted in this “Color of Law” complaint. 110 & S/W Graham St.
Paragon – 3535 Glenwood Ave.
4411 Durham Chapel Hill Blvd. DCF 1020 S. Kansas Ave. 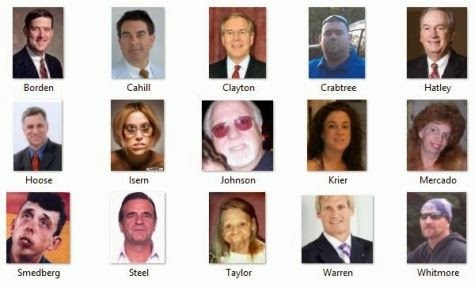 THERE ARE AT LEAST 34 OTHER WITNESSES who were victims of cyber-crimes emanating from the farmhouse in Potwin, KS, and contact information (email addresses) can be accessed by clicking here. The answer is simple and bifurcated as follows: (1) Franchise Value – literally $ billions in franchise value have been at stake with pending civil claims alone at $2.5 billion; and (2) Mindset – there is a pervasive belief among wayward bank executives (e.g., John Mack, Bob Steel and Bob Hatley) that they are immune from criminal prosecution, and in the rare instance where their criminal acts are exposed and prosecuted, their personal culpability can be readily expunged through the payment of a relatively nominal fine by the banking corporation involved to the U.S. Justice Department. So the message to criminal bank executives (a/k/a “Banksters”) is this: YOU ARE ABOVE THE LAW and if enough money is at stake, it is in your best interest to commit as many crimes as necessary. A. CRIMINAL DESTABILIZATION OF PROPERTIES – A prolific, multi-faceted and highly coordinated assault was executed to economically destabilize Complainant’s commercial property investments in Durham and Chapel Hill, NC, entailing extensive commercial sabotage and the deliberate and profound failure by local public officials to carry out their duties to simply enforce local property laws and ordinances, including the Town of Chapel Hill and the City of Durham. B. SMEAR CAMPAIGNS – This entailed the publishing of over 60 false, disparaging and libelous articles about the Complainant to complement the above property destabilization by four local NC newspapers, including The Daily Tar Heel, which is a publication of the University of North Carolina. ALL such articles were rife with prevarication and centered on one property, which was the principal target of the commercial sabotage and carefully orchestrated controversy; however, not a single article was written about the fraudulent foreclosures of his other properties. One of the smear campaigns involved a rural farmhouse in Potwin, Kansas, which is actually a disguised front for a high-tech hub of widespread identity theft, cyber-stalking, computer-hacking and various other computer-based crimes – click here to access details and be sure to scroll down to read all associated posts, where you will note the FBI has “stubbed its toe” on this particular matter, as they were alerted to it long ago, but due to inaction, MANY others have been additionally victimized (as identified via hyper-link in the “Victims” section above). C. FRAUDULENT FORECLOSURES – Foreclosing on real estate properties (principally located in NC) owned by Complainant’s corporations, which were valued at $22 million on mortgages of $9 million, even though NONE were in default and where the coup de grace was a . . . I. UNLAWFUL SEARCH & SEIZURE – The ransacking of Complainant’s Florida residence, which was carried out during his unlawful incarceration, and was predicated on a woefully flawed and patently unlawful search and seizure, the sole purpose of which was the . . .
M. DENIAL OF RIGHTS & RESOURCES – In order to cover-up this outlandish mess of scandalous wrongdoing that implicates an astonishing number of people and organizations, there has been a concerted effort to deprive the Complainant of financial resources (including the theft of his eight-figure net worth), deny him competent legal representation (through unlawful threats), and thwart investigations through fear and intimidation. As it pertains to his wrongful arrest and unlawful 127-day incarceration, seventeen of his Constitutional rights were violated. 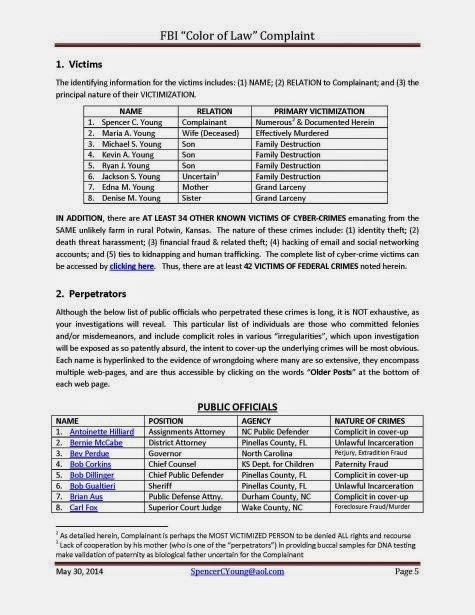 Reflected below are those who are hereby criminally charged, and the particulars supporting these indictments can be accessed by clicking on each of the names. Through this filing, the FBI is being asked to objectively execute its mandated responsibilities to prosecute the 35 public officials and 15 private citizens indicted herein, who collectively committed 28 broadly defined Federal crimes. By so doing, such horrific injustices will not only be rectified, but substantial benefits will inure to countless others – this being the case because it became clear throughout the course of these obviously choreographed events that corruption was systemic at the federal, state and local levels and permeated across a wide spectrum of governmental agencies. Moreover, there are many others not specifically indicted herein who played a role in these crimes, and it is expected your investigations will naturally identify them – for instance, after being apprised of extensive criminal wrongdoing, the inaction of the respective mayors and town councils of Chapel Hill and Durham, NC, would affirm their complicity in these crimes and suggest a level of kakistocracy that is disturbingly unprecedented. Also conspicuously missing from the list of those indicted, but yet principally responsible for instigating and sponsoring these crimes are: (1) former Morgan Stanley CEO John Mack; (2) the trio of colleagues at Morgan Stanley, who instigated the initial employment fraud AND later assumed leadership roles in the Sub-Prime Mortgage Fraud & Related Market Meltdown that brought the US economy to its knees (Anthony Tuffariello, John Westerfield & Warren Friend); and (3) members of Morgan Stanley’s Board of Directors who were apprised of the criminal acts but did NOTHING in response and therefore endorsed the criminal activities; they have been excluded because Morgan Stanley’s involvement is many degrees removed. Notwithstanding, your investigations will no doubt reveal their insidious sponsorship involvement as you begin prosecuting those indicted herein, most especially when “deals” are cut (e.g., plea bargains) to go after the criminal kingpins. 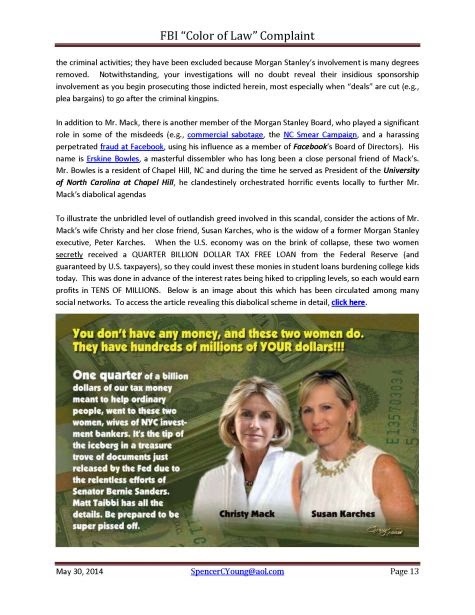 To illustrate the unbridled level of outlandish greed involved in this scandal, consider the actions of Mr. Mack’s wife Christy and her close friend, Susan Karches, who is the widow of a former Morgan Stanley executive, Peter Karches. 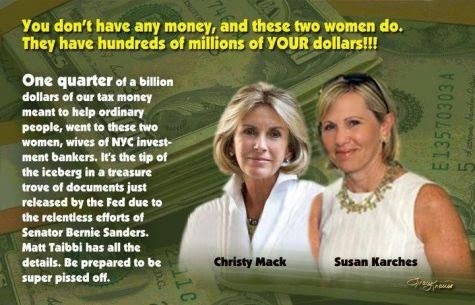 When the U.S. economy was on the brink of collapse, these two women secretly received a QUARTER BILLION DOLLAR TAX FREE LOAN from the Federal Reserve (and guaranteed by U.S. taxpayers), so they could invest these monies in student loans burdening college kids today. This was done in advance of the interest rates being hiked to crippling levels, so each would earn profits in TENS OF MILLIONS. Below is an image about this which has been circulated among many social networks. To access the article revealing this diabolical scheme in detail, click here. Although various areas of the FBI, and the Department of Justice have been separately alerted to some of these crimes in the past, their responsiveness has ranged somewhere between “benign neglect” and “reckless disregard for mandated responsibilities”. Information has been received suggesting certain officials from these Federal organizations of law enforcement have been on Morgan Stanley’s “bartered payroll”. Hopefully this is not the case, and your responsiveness to this criminal complaint will speak volumes, which will most certainly be included in the upcoming exposé, Cannibals In White Shoes.